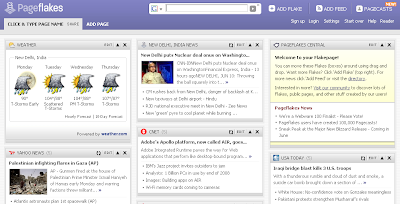 Out of the many options for your homepage, Pageflakes is one of a few webtools, which allow you to put your RSS feeds, YouTube videos, search results, your personal to-do list and many other widgets on one page. Below is screenshot of my homepage on pageflakes. I must say that this tool is really useful and time saving. Recently, they have started a new service called Pagecasts, which they describe as “the intersection of personalized pages with social media”. Click here to go to Pageflakes.